The PEW Research Center’s recent study of Hispanics went beyond the issues of identity covered in a previous post. They also analyzed questions about Hispanics experience as Americans. Hispanics surveyed were relatively evenly divided in their use of language with 38% speaking mostly Spanish, 38% are bilingual, and 24% speak mostly English. However, the shift to English rises quickly with each generation. 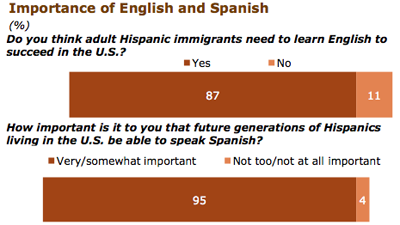 Hispanics agree that learning English is important to success in the U.S. 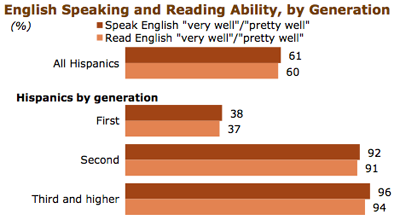 While Hispanics agreed that learning English is important to success only 38% first-generation Hispanics report being able to speak English well. However, subsequent generations have high frequencies of English competence. The kind of results make a lot of sense to me given how quickly children pick up language and how difficult it is for many of us to master a new language as an adult. Belief that people can get ahead if they are willing to work hard is higher among Hispanics (75%) than members of the general public (58%) and only 21% of Hispanics say hard work and determination are no guarantee of success while 40% of Americans in general agree with that statement. 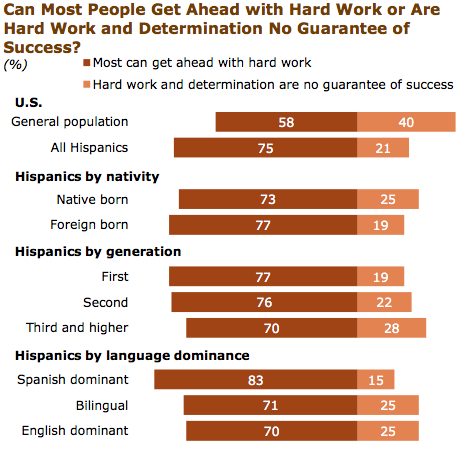 As the figure on the right shows, Hispanics who spoke mostly Spanish (83%) and first generation (77%) Hispanics are even more likely to believe in the rewards of hard work. Hispanics are also less trusting than the general population. While 35% of Americans would say that most people can be trusted, only 12% of Hispanics feel that way while 86% say that you can’t be too careful in dealing with people. While 79% of Hispanics would come to the states again (and only 15% would stay), they see both good and bad in the U.S.
As the figure on the right reveals, Hispanics are nearly unanimous in their agreement that opportunities to get ahead are better in the U.S. They also overwhelmingly consider America better at treating their poor and a better place to raise children. Their vote of confidence for America’s moral values of society are not quite as strong with 44% preferring the moral values of American society and 21% leaning toward their country of origin (with 32% saying that the countries are the same). 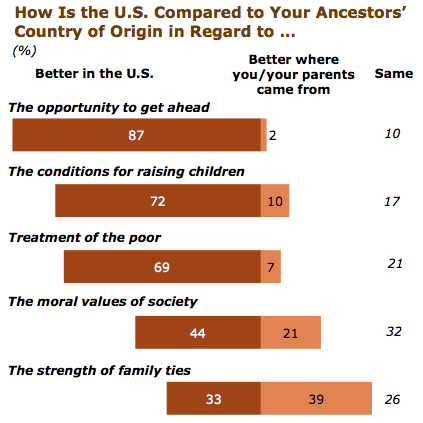 Further, only 33% of Hispanics considered the strength of family ties better in the US with 39% feeling that they were stronger where the respondents or their parents came from. Given the amount of debate about moral values in America, Hispanics are not alone in their concern. If marriage is any indicator, Hispanics are ready to assimilate. Very high percentages expressed comfort with their child marrying someone with different heritages. Their comfort was lower when it came to someone with different religious beliefs, but Hispanics still expressed comfort with that scenario by a better than two-to-one margin. I’ve spent a lot of time among Hispanic families (I married into one) and I’ve often been struck how typical they can be. The language spoken and the food on the grill may be different but Hispanic families share most of the same dreams, worries, joys, and good-natured ribbing that I grew up with in east Texas. Those closest to their country of origin display retain some differences in music and television, but these melt with each generation.